By this time, school is likely back in session in most, if not all, parts of the country. And even if you don't have children, those big yellow buses rumbling over the roads are probably a reminder that the doors of education have once again been swung wide open for another year of learning. The field of education is near and dear to my heart. I have a teaching degree, several of my siblings either do or have worked in the field of education in some capacity, my mother was a teacher, and so were several of her siblings. And my mom and dad first met when they attended a one room school house together as children in the hills of Eastern Kentucky. My mother later ended up even teaching at that same one room school! Now you might think from the title of this post that I plan on focusing on the education that children receive, or did receive, in the mountains of Appalachia. But that's not where I'm really headed with this. Rather, when I say "A Mountain Education," I am speaking of the education you can give children about the mountains...more specifically, about their mountain roots. I am always looking for ways I can teach my children about their Appalachian heritage. I'm a huge fan of the saying "You'll know better where you're going if you know where you've been." Keeping the mountain culture and way of life tangible and understandable to the youngest descendants of migrants can certainly be a challenge. However, when life gets hectic, and actual trips "back home" may become infrequent, there are still ways to pass along a knowledge and love of our mountain culture to those little ones. In this post I'm going to tell you about two children's books that I just adore. They both can be used to teach kids about their Appalachian roots...and they both happen to be by the same author. Have you ever heard of Cynthia Rylant? Rylant grew up in West Virginia in the 1960's, so she knows Appalachia well. She is an award winning author, with multiple publications...and several of her works are set in the southern hills. The first book of Rylant's that I ever read was Appalachia: The Voices of Sleeping Birds. I immediately fell in love with it, for she speaks of some of the most subtle Appalachian ways...that an outsider to the culture might completely overlook as utterly insignificant...yet they resonate as golden memories and emotions when read by someone with childhood mountain experiences. I find myself smiling and pining at her mention of mountain people's given names, the Appalachian migrant's experience, the arrangement of bed coverings, where dogs should be kept, abundant food and what's done with the leftovers, and the special scent of the outdoors in the mountains. These and more are all things that I can truly relate to from Rylant's book...and her words take me back to childhood trips to my Mamaw and Papaw's Appalachian farm. Now for all my love of this book (because I really do think it is a great piece of writing with a tremendous teaching value), I have to put a disclaimer on the book as well. Appalachia: The Voices of Sleeping Birds is meant to be enjoyed by older children...or adults like me! It is likely too lengthy and wordy for preschoolers and younger elementary students. So it is best for upper elementary grades or higher. And one more disclaimer for this book...if you give this book to your children, grandchildren, etc. to read, PLEASE read it for yourself first, AND discuss it with them afterwards. Rylant's writing style in this book paints broad, all-encompassing brush strokes about the Appalachian people. It makes for a great read, but you definitely want to make sure any youth reading it realizes that the things she says about people in Appalachia are generalizations that don't accurately describe everyone in the region. ...but despite this little hiccup, I still gotta say that this book speaks to my heart. If you read it and something about it speaks to yours too, share it with the youth in your family. And talk to them about what you can relate to in the book...it will do them and you good, trust me! You can purchase Appalachia: The Voices of Sleeping Birds here. Or if you would like to support an Appalachian based bookstore, you can purchase it here, at the Jesse Stuart Foundation. LOVE that place and what they do to promote Appalachian literature! Rylant's other book that I recommend is When I Was Young in the Mountains. You can probably read this one to a bit younger audience than the previous book. This work is set in the past in Appalachia, so you want to make sure that children who read it understand that it is not about modern day Appalachia. This book shows the loving care given by the narrator's mountain grandparents and the sweet warmth of their Appalachian home. I love her mention of pinto beans, smell of sweet milk, and baptisms in a swimming hole. But perhaps my favorite part of the book, is when she talks of how her grandmother goes after a black snake with a hoe. Now can't you all relate to that!? I can't tell you the number of times I've heard a story about one of my Appalachian grannies getting a snake with a hoe! 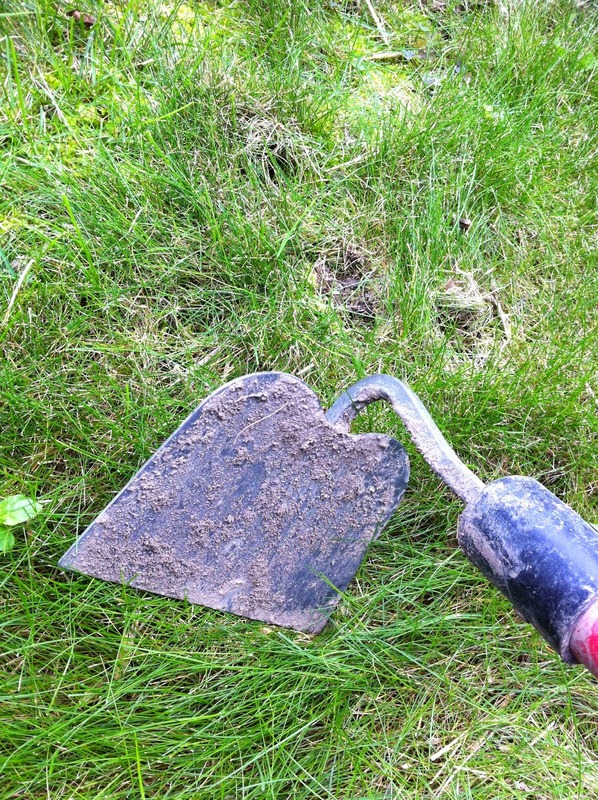 Garden hoe, minus the snake…'cause there's a limit to the lengths I will go to for a good visual aid! And the last page of the book really makes me smile for all the sweet things it says about the region. It truly is a beautiful tribute to our culture. You can purchase When I Was Young in the Mountains here. Or, the Jesse Stuart Foundation also carries it here. Now I also want to share with you a fun way you can hear When I Was Young in the Mountains being read. One of my all-time favorite websites is Christy Jordan's Southern Plate. Christy is from the Appalachian Mountains of Northern Alabama and in addition to being a blogger, cookbook author, and an editor for Southern Living Magazine, etc., she reads children's books on a section of her website called Story Time. One of the books she reads is When I Was Young in the Mountains, and I just love to watch her video of it! You can give it a listen here. While you are there, make sure to check out all her other Story Time videos and share them with the little ones you know...she's got a lot of fun ones! And I promise not to tell if you sneak over to her list of southern recipes while you're there. Believe me, they are drool-worthy! As a little sidenote, I happen to know (from first hand experience) that Christy's recipe for chocolate cobbler is to die for! It's become a go-to recipe when I want a quick but REALLY delicious weeknight family dessert. ...you're welcome! Chocolate cobbler I just baked using Christy Jordan's recipe from Southern Plate…SO GOOD! I hope this post has given you a few ideas for sharing our mountain heritage with the little ones in your family. Passing that heritage down to the next generation is a great way to celebrate all that is wonderful about our Appalachian culture! Hope to see you back here soon! God bless! Oh my goodness, what a wonderful post to read and what an honor to be mentioned in it!!! I'm gonna have to curl up with a quilt, some coffee, and your blog for a few hours in the very near future! Thanks, Christy! The honor is mine, though...your blog and website are fantastic! I am so happy to find your blog, I grew up in Cumberland , Kentucky but moved away in 1985. I absolutely love the Kentucky mountains and the older I get the more I yearn to go back. Unfortunately, I don't make it back very often(it has been at least 3 years). Life growing up was very hard but I wouldn't trade it for anything. I am following you on Pinterest and am following your blog as well. Mamia, thank you so much for the comment. I am so glad that you like the blog! It's a blessing to hear when other's with Appalachian roots can relate to the things I am writing. I pray you have a wonderful Christmas!